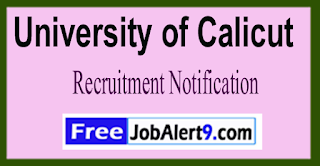 University of Calicut Has Released Recruitment Notification For 83 Guest Lecturers Posts. All Eligible And Interested Candidates Can Attend Walkin Interview On 23-05-2017 to 06-06-2017 (23rd May to 6th June 2017). Further Detailed Information Regarding Educational Qualifications, Age Limit, Selection Procedure, Exam Pattern, Syllabus for University of Calicut Recruitment 2017 - 83 Guest Lecturers Post is mentioned below. Age Limit - Candidates upper age limit should not Exceed 40 -Years As on (01-01-2017). How To Apply - All Eligible & Interested candidates are required to attend walkin interview along with relevant testimonials to the following Address on (23rd May to 6th June 2017). Address -Administrative Block, University of Calicut . Date of Interview- 23-05-2017 to 06-06-2017. 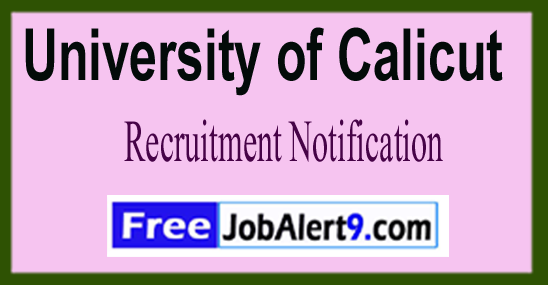 Click Here For University of Calicut Recruitment 2017 Detailed Advertisement.